Holland America Line’s EXC In-Depth Voyages to Alaska will amaze you! People who love the cruise experience enjoy finding new and exciting ways to see and explore the globe. If you fall into this category, the Holland America Line EXC In-Depth Voyages and Alaska cruises were created for people just like you. The itineraries are specially crafted to provide innovative and custom approaches to cruising. These features allow travelers to explore the most fascinating expanses of the globe and view them through the collective of their personal interests and passions. If you would like to see as much of Alaska as possible on a single cruise, the 21-Day Ultimate Alaska & Pacific Northwest Adventurer EXC In-Depth Voyage is perfect for you. This is the most in-depth Alaska exploration available in a single cruise. There are no Alaska cruise that can compete with it. You will experience the best of the Last Frontier, its breathtaking scenery, fascinating Prince William Sound wildlife, Tracy Arm, and the Hubbard Glacier. This is a round trip cruise from San Francisco on the ms Maasdam, and you will spend two days at sea before arriving in Ketchikan, Alaska. Ketchikan is a quaint fishing village with a deep-rooted history in the salmon fishing and packing industries. Guests can choose to take a sports-fishing excursion and try to get a photo-worthy catch. You may prefer to dine at a local restaurant, and enjoy your seafood prepared for you. Ketchikan is also home to the rich cultural accomplishments and sights of the Tlingit, Haida, and Tsimshian native Alaskan tribal nations. 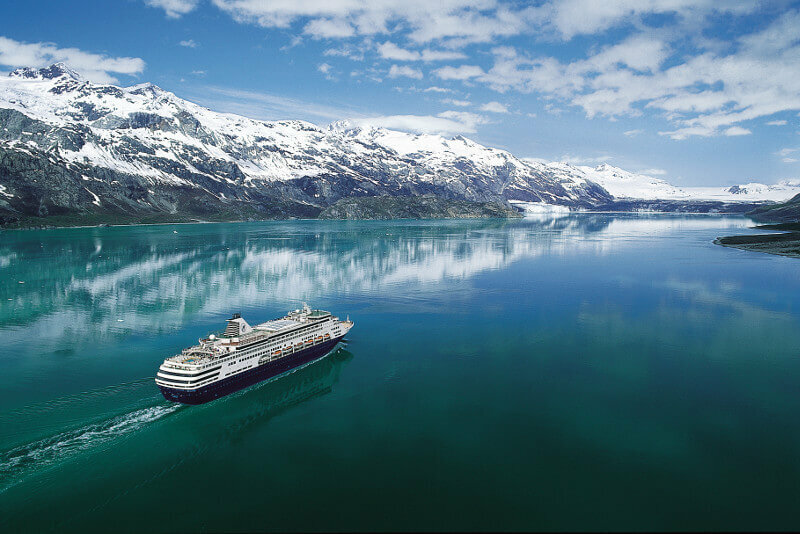 Click here to browse our Holland America Line Alaska sailings. The next day, your ship visits Sitka to view the vestiges – National Historic Landmarks – of past Russian influence such as the onion dome of St. Michael’s Cathedral and the Russian Bishop’s home. The Visitor’s Center at the Sitka National Historical Park and immerse yourself in the fascinating collections of Russian and Native Alaskan artifacts. A ranger-led tour takes guests to the battlefield where the native Tlingit were defeated by Russia. The next day of the cruise, keep your camera handy as you cruise Hubbard Glacier, North America’s longest tidewater glacier. The scenery will be amazing! On day seven the beauty continues as you cruise through beautiful Prince William Sound. Photograph countless fjords, glaciers, and breathtaking mountain vistas. You’ll arrive in Valdez, Alaska, a fishing enthusiasts paradise. All salmon varieties and huge halibut can be caught here. Multiple rivers and streams spill into the sound, which provides a great opportunity for kayaking tours.